Goals: Build a reliable platform for the delivery of free and paid digital content via an easy to maintain and affordable eCommerce platform. WordPress Development, Business Website, Digital Content Strategy, Digital Production Services. 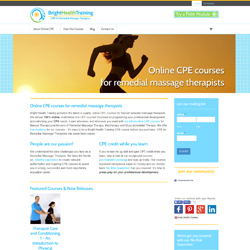 Bright Health Training offers online professional development courses for massage therapists. The business was a startup when this website was built. As this was a new business, the development process needed to be flexible, staggered and affordable. The main site is built on the WordPress CMS, using a customised Theme to reduce the design cost. The Bright Health Training’s content strategy centres around the instructional videos in the courses and blogging. The site and videos are responsive to provide and optimised user experience on mobil devices, as it was identified that therapists are likely to be viewing the videos between session on their own personal devices. The eCommerce component allows for purchase of course material, which then assigns the customer to a group with access to otherwise restricted access. WooCommerce (eCommerce plugin for WordPress) was used and the design customised to match the style of the rest of the site.